Drums and rhythm are the glue that holds music together. So what does it mean when you listen to a song and the drums make you feel as if everything is about to fall apart? This is the case with many of the songs on "exiles," the latest release from Burlington's Violette Ultraviolet. The drums on the duo's new record — much like last year's Love Wait What Yes EP — are off-putting, at least initially. They seem like a sloppy afterthought by multi-instrumentalist and founding member Rob Voland. However, by record's end I found I still loved the songs all the same, sloppiness be damned. That got me thinking. Sure, the rhythms on "exiles" are brittle. This is likely because Violette Ultraviolet will often go into recording sessions all but unrehearsed and then use their first takes. But what gets lost from the beat is found in the overall artistic impact of the band's sound, which is an exploration of emotions on the verge of unraveling. "Exiles" opens with "My Old Town," in which singer Jake Brennan belts atop a sobbing slide guitar, "They like it when you're down and out, they really like when they feel like you've got nothing left." This poignancy persists with "One More Sunset." Here Brennan admits, "I don't care 'cause I bruise to the core." It continues on the third track, "Dialogue," where Brennan takes on the tone of Kings of Leon's Caleb Followill, tinged with the sadness of Elliot Smith. Even the guitar solo in "Soma" seems troubled, while "Wet" asks the question, "How wet does my face need to be?" "Suicide" offers pained and wicked guitar tones alongside vocals that channel an equally pained and wicked Billy Corgan. Heartache continues with "Black Tar," which has a chilling repetitiveness dotted by reverberated piano phrases. Throughout all of this, Voland's drums follow Brennan in telling the story of someone on the cusp of losing it all. The distress that permeates "exiles" finally climaxes with its last track, "Crimes." Here Brennan's voice breaks into a cathartic scream, signaling the imminent falling apart of music and emotion to end the album. Ultimately, "exiles" is the musical performance of a psyche teetering on the edge of its own collapse. This is true of Brennan's lyrics and vocals, as well as the accompanying instrumentation — particularly Voland's drums — making the album wholly unified in musical approach and emotional condition. Still, the highest compliment one can pay Violette Ultraviolet is to say that "exiles" offers us a fantastic 40 minutes of delightfully distraught, lo-fi indie rock. 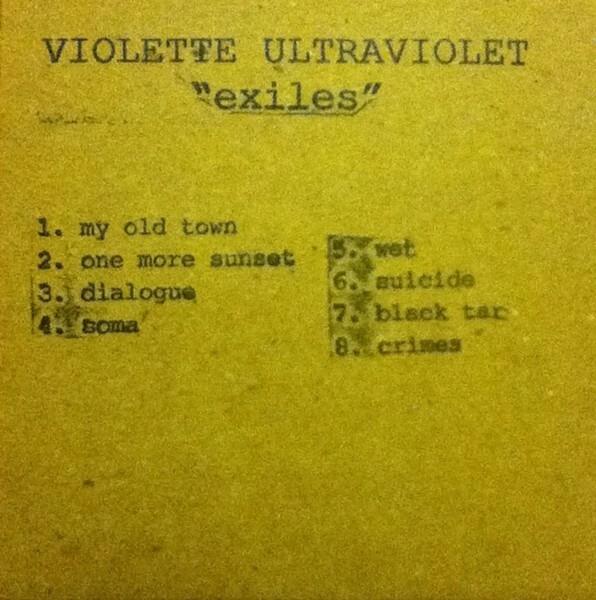 "Exiles" by Violette Ultraviolet is available at violetteultraviolet.bandcamp.com.